I was recently configuring the HP 3PAR monitoring for System Center Operations Manager 2012R2 for a customer. 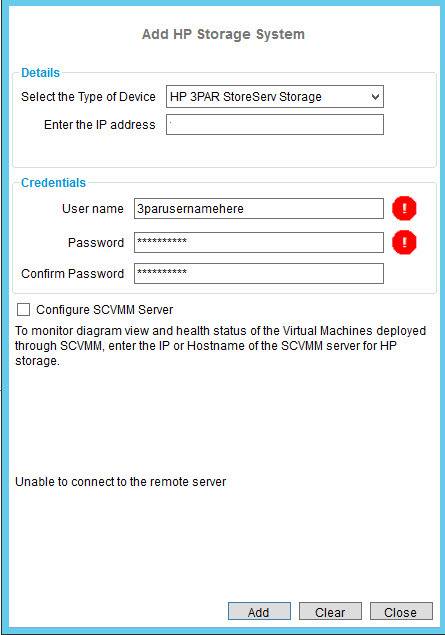 After installing the HP SCOM Storage Monitoring Application and adding my local management server, I proceeded to add the HP 3PAR Storage System via the HP Storage Management Pack User Configuration Tool and received the error “Unable to connect to the remote server” whenever I attempted to connect. I confirmed my username/password was correct – even setup a new account, all with the same result. It turns out that the CIM service was not running on the 3PAR, which is a requirement for the application/management pack to function. I connected to the storage system via SSH, typed “showcim” and confirmed that it was not functional. Running the command “startcim” started the CIM service and after a few seconds, returned to the HP Storage System dialog and re-connect with success! Finally, after enabling discovery in SCOM for the Management Server and waiting a couple of minutes the storage system appeared in SCOM and reported as it should.